An idle game in which your stable of heroes kill monsters for gold. As I assume is true of most idle games, its structure is based on a series of concentric gameplay loops. 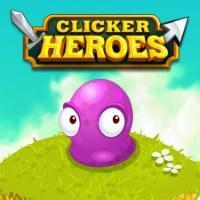 First you’re clicking monsters to kill them and collect gold, which you use to hire and upgrade heroes. The heroes make the monster loop faster, so after a while you stop focusing on individual monsters and instead use the constant flow of gold to manage your heroes, occasionally using their powers (which are on cooldowns of varying length) to make a lot of progress quickly. But despite being in the title, the heroes are just one of several loops - eventually you start “ascending”, sacrificing your heroes to start over but collecting “hero souls” which you use to upgrade “ancients” that give you passive bonuses that make the hero loop faster. Then you start “transcending”, sacrificing your ancients to start over but collecting “ancient souls” which you use to upgrade “outsiders” that give you passive bonuses that make the ancient loop faster. There are a couple of other mechanics, such as relics that are essentially another facet of the ancient loop and mercenaries which grant rewards on timers. And somewhat evilly, there are “guilds” that present a lightweight social obligation factor through daily “raids” that must be collaborated on to make any real progress. It can be satisfying, in a mindless way, to check in on your increasingly-huge numbers for a few minutes here and there. But ultimately, the game is a treadmill, doling out progression on longer and longer schedules. As such, the only way to win is not to play. I Stopped Playing When: I put the game down and picked it back up a few times, alternately getting bored with it and then getting it back in my head because someone else was playing it and talking about it. I put it down for good after the Transcendence update because the changes to Ancients made the game less fun to me.